Dirty kitty needs a bath! In the sink getting shampooed! 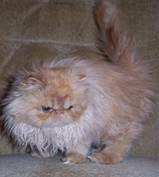 One of the advantages of buying a Persian kitten from a reputable breeder is that he will be accustomed to regular bathing. Grooming is not the terrible chore some people believe, and can be soothing and enjoyable to both cat and owner. When a cat is kept bathed and clean, there is need for only minimal combing or brushing in between baths. Also, a clean cat does not have problems with hairballs. Clean cats do not shed the dander that causes many people to have allergic reactions. 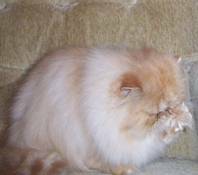 Most Persians need baths every 4-6 weeks to look their finest, but some can go longer intervals. The absolute first thing to do before a bath is clip the cat's claws! Start a bath with wetting the whole cat. It is recommended you bathe him in a laundry room type sink, or in the kitchen sink, where a sprayer type hose is available. DO NOT dunk the cat in water – it does not adequately rinse him, and it will scare him. After he is wet all over, slather a waterless mechanic’s hand soap (such as GOOP which can be found in the automotive section of most Wal-Marts - DO NOT USE any product that contains "orange") liberally all over him, excepting the area immediately around his eyes, nose, and mouth. Concentrate on the chin, the ears, “ruff” area, and in and around the front legs. Be sure to use enough all over him until his coat feels slimy or “gooey.” We usually use 7-10 ounces of GOOP on each cat. Groomer's Goop is even better if you can find it (we order online from Revival Animal). Rinse the waterless mechanic's hand soap off the cat until the water runs clear. Now shampoo him with liquid dish soap such as Dawn (keep out of the eyes!) Rinse the dish soap out. Repeat & rinse well. If you feel he is still greasy, you can repeat either or both until you are satisfied with the condition of his coat. A clean coat will feel soft and silky as the rinse water flows through it. Proceed by sudsing with a “human” shampoo for oily hair or a PH balanced pet shampoo or your choice. Rinse very well. Wash face and eyes with a tearless baby shampoo on a washrag. A conditioner at the end of the bath will help keep his coat from tangling and makes it easier to comb out. You might find it helpful to dilute about 2 tablespoons of conditioner in a quart of warm water & pour it over him, or you can spread it on full strength. Rinse the conditioner out. 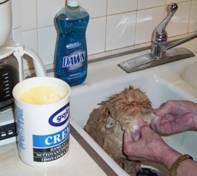 It can take a while to rinse conditioner out, but getting it out is important for getting the cat dry. Towel dry the cat (blot dry), then proceed to blow drying. The cat is accustomed to this process, but don’t be surprised if he tries to test you the first few times to see what he can get away with. 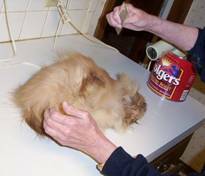 Use a hand-held pistol-style hair dryer propped up in a coffee can that can be weighted with cat litter. You will need probably two combs, one medium, one large, and a slicker brush. Comb and brush with the dryer blowing on the cat. You will need to dry him until he is thoroughly dry, excepting only some of the face area. Never point the hair dryer at any one area for too long, as it can burn the skin. Leaving him wet can cause the hair to dry curly and mat, not to mention getting chilled. Finally, use a Q-tip dipped in Boric Acid Powder (found at most drugstores) to clean and dry out his ears. The boric acid powder is a powerful drying agent that will dry up any water that you might have gotten in his ears during the bath, and thus prevent ear infections. Do not insert the Q-tip into any part of the ear you cannot easily see, as you can damage his ear. In worst-case situations, if your Persian should become badly matted, do not try to comb or cut out mats. Either take him to a professional groomer or your veterinarian to be clipped down into a “lion” cut. The cats don’t mind, and it is much better to save them and you the pain and aggravation of trying to remove mats. Some Persian owners routinely have all or part of their cats clipped for summer.